Revealed at the Los Angeles Auto Show, Alfa's first ever SUV is described as a premium, mid-size model aimed at driving enthusiasts in one of the largest and fastest growing market segments. Available in three trim levels - Stelvio, Stelvio Ti and Stelvio Quadrifoglio - all models are powered by new, all-aluminium engines - starting with the 2.0-litre direct-injection turbo engine mated to an eight-speed automatic transmission, which delivers 280 hp for a top speed of 144 mph. Standard features include a carbon fibre driveshaft, dual exhaust with ‘bright tips’, 18-inch alloy wheels (available 19- and 20-inch wheels), leather seating, reversing camera with rear park sensors, powered tailgate and Formula One-inspired flat-bottom steering wheel with integrated push button start. The Stelvio Ti adds even more luxury and convenience offerings, including standard 19-inch wheels, genuine wood interior accents and an 8.8-inch widescreen infotainment display. Available with Sport and Lusso packages, each provide drivers with further offerings to accentuate the characteristics of the Stelvio Ti. The range-topping Stelvio Quadrifoglio 'ultra-high performance' SUV is powered by a direct-injection 2.9-litre bi-turbo V6 engine, delivering 505 hp, transferring power to Alfa’s Q4 all-wheel-drive system as standard. 0-60 mph takes 3.9 seconds on to a top speed of 177 mph. 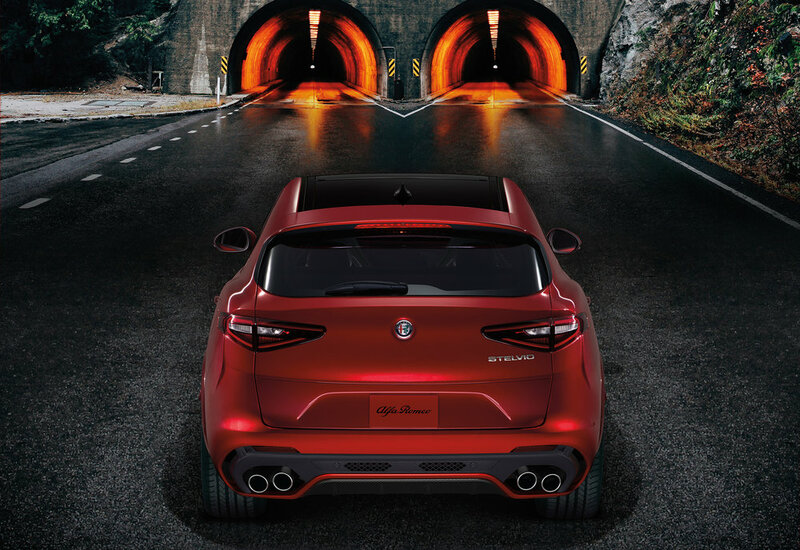 The Stelvio Quadrifoglio includes exclusive high-performance and functional exterior design elements, plus performance suspension, brakes and wheels. Inside, high performance leather and Alcantara front seats, featuring 12-way power and adjustable thigh support, provide the ‘optimal control centre’. Additional features include a Quadrifoglio-exclusive leather-wrapped steering wheel with accent stitching and performance contours, leather-wrapped instrument panel with accent stitching and carbon fibre interior trim. Four-mode Alfa DNA Pro selector with Race mode, is joined by a torque vectoring differential, Quadrifoglio-tuned adaptive suspension, Quadrifoglio instrument cluster with 200 mph speedometer and cylinder deactivation system. For improved fuel efficiency, the Stelvio Quadrifoglio features a Cylinder Efficient Management (CEM) deactivation system, which enables the engine to run on three of its six cylinders. Further high performance options for the Quadrifoglio include ultra-lightweight carbon fibre shell Sparco racing seats as well as a high-performance Brembo carbon-ceramic material (CCM) brake system. Alfa Romeo has yet to confirm when the Stelvio will arrive in the UK.